Castor bean, photographed along Congress Avenue, Boynton Beach, Palm Beach County, in October 2013. The problem with castor bean, Ricinus communis, is its wide utility. It is an extremely useful plant and an attractive and adaptable one as well. It's also an invasive plant, and the primary vector for its spread is us humans. For 6,000 years we've been using castor beans in medicines, cosmetics and construction. We've used its attractive foliage to beautify our homes. But it is a fast grower, quickly able to transform a meadow or a fallow field into dense thickets that crowd out everything else. It is a subtropical plant but can grow, thrive even, in much colder places. It grows throughout much of Florida's Peninsula and the Keys but also as far north as New Hampshire and Massachusetts. And it produces a deadly poison known as ricin. Eating as little as six seeds will kill a horse; as little as two and a half can kill a human. The castor bean story begins in Northeast Africa, Ethiopia most likely. The ancient Egyptians discovered the benefits of the plant, and passed it on to the Greeks and Romans, who, in turn, spread it to the Middle East and Mediterranean. It's made its way around the globe, to Asia, the Pacific and the Americas. It's found in about half of the United States as a naturalized plant. 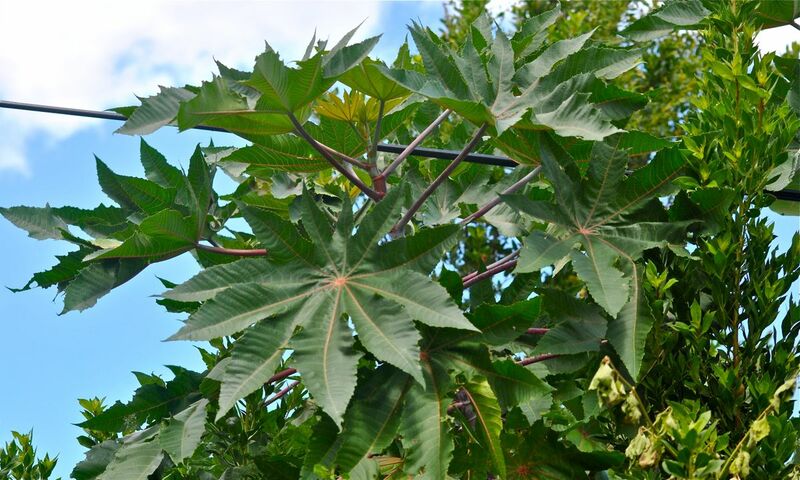 The Florida Exotic Plant Pest Council lists castor bean as a Category II invasive, meaning it's spreading in the wild but has yet to do any significant ecological damage. In some places around the globe, it is a severe pest. We've probably made it a bigger pest than it might have been naturally, because we've selectively bred it for increased seed production. Castor bean was sold in Florida until 2001, when the state's commercial nurseries agreed among themselves to ban its sale, but it's still extremely common. 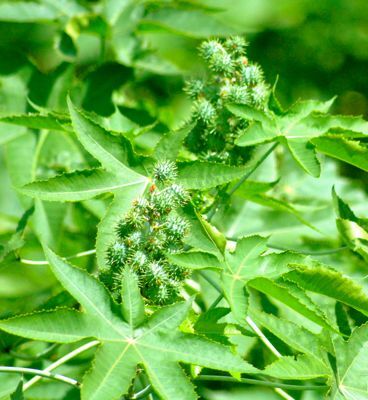 In colder climates, castor bean is an annual shrub, growing to about 10 or 15 feet tall in spring and summer before dying back in the fall and winter. In warmer places like Florida, castor bean is a perennial able to grow throughout the year and form into a small tree 30 or 40 feet tall. Castor bean leaves are large, simple, almost star shaped, with five to nine sharply pointed lobes, the edges sharply toothed. The leaves of the plants we've seen are green, but cultivated varieties can be deep red or purple. Castor bean stems are round and can be red or purple (see the top photo). 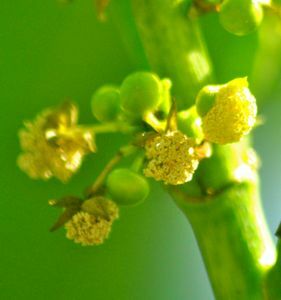 The flowers are yellow and not much to look at; male and female flowers are found on the same plant. The fruit is spikey, containing dark brown seeds that are the inspiration for the plant's scientific name. 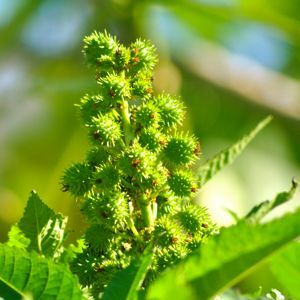 Ricinus is Latin for 'kind of tick,' according to the University of Florida, and comes from the resemblance of the seeds to blood-engorged dog ticks. Lovely. The source of its common name is more obscure. Unknown, in fact, according to UF. It's the outer coating of the seed that contains the poison. A whole seed ingested will most likely pass through a body without creating any ill effects. But if it's chewed and the coating broken, you've got someone seriously ill. The seed minus the outer coating is extremely useful. Children of generations past have nightmares about taking castor oil as a kind of cure-all for stomach problems. The plant's oils have been used in bath soaps, likpstick and lotions. They're particularly useful for their soothing and moisturizing effects on skin. Industrial uses include paints and coatings. The wood has been used in fiber board. From World War I through the 1960s the oil was used as an aviation lubricant. In the early 1900s, the Wakefiield Oil Co. added castor oil to conventional motor oil to create a product called Castrol. The additive made the oil fluid enough at cold temperatures, but also thick enough at high heat. Native Americans used parts of the castor bean to treat acne and sores, to relieve headaches and break fevers. The Navajo used it as contraceptive; the Seminoles used it for constipation. Castor bean is a member of Euphorbiaceae, the same family as the poinsettia. 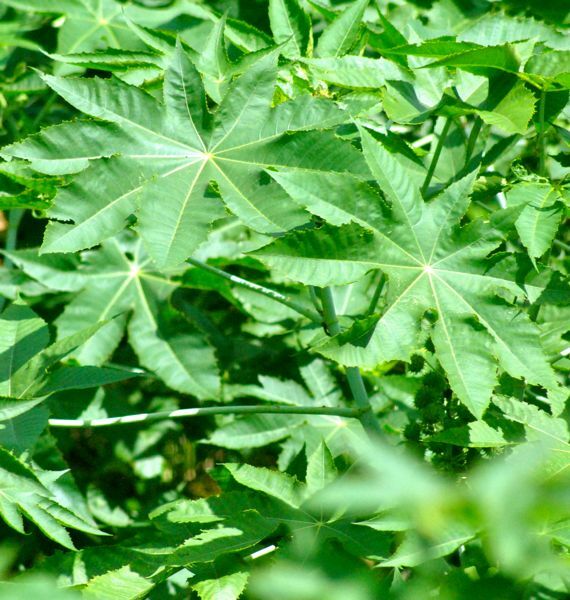 Other common names include castor-oil plant, palma christi and wonder tree. All photos are property of the publishers and may not be used without their permission. 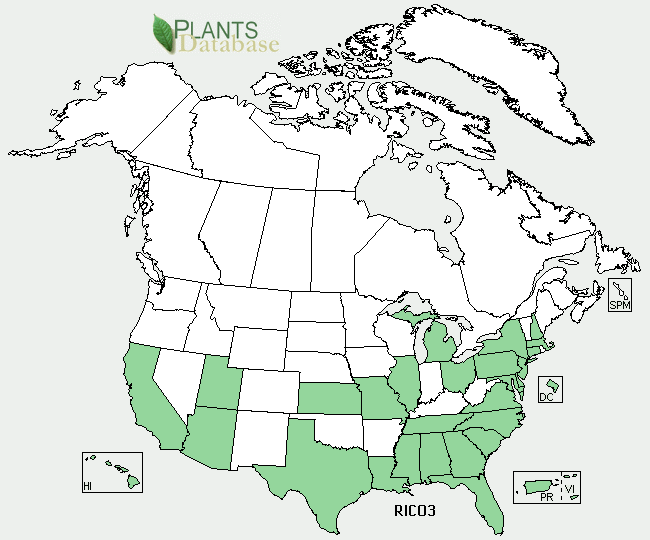 United States Department of Agriculture (USDA) distribution maps for castor bean.